You know how Konami tried to pull Hideo Kojima’s name off the box art on their website? With Metal Gear Solid V: The Phantom Pain, Kojima more than gets his due. Every mission in the newest Metal Gear game—which will almost certainly be Kojima’s last—both begins and ends with a brief credit sequence that runs through the game’s creative leads, including the controversial director, who might have more title appearances in MGS V than Kiefer Sutherland has lines. The words “Hideo Kojima” are plastered everywhere. In a vacuum, it might not be noticeable, but in the context of what’s been happening at Konami, it’s goddamn hilarious. From what I’ve played so far, MGSV is legit. It’s totally different than any other Metal Gear game—farewell, CAUTION meter!—yet it’s still got that vibe you can only find in Kojima’s longrunning series. Few games have dialogue as incoherent, yet poetic. Few games make you feel like as much of a supersoldier. If you’ve played Ground Zeroes, which came out last year and serves as both prequel and demo to the real MGSV, you already have some idea of what you’re getting in September. The core rhythm is the same—you, as Snake, creep around hallways and bushes, tagging baddies with your binoculars so you can quietly take them out en route to your objectives. There are a few minor interface differences—interrogations, for example, look a little different now—but if you liked the feel of Ground Zeroes, this one will make you happy, too. I won’t dig into the story here—partially because I don’t want to spoil it and partially because it’s incomprehensible—but I will give you a quick look at some of the notes I jotted down during my two hours with Metal Gear Solid V.
At least the first few hours of the game all take place in Afghanistan, with a brief sojourn at Mother Base (newly rebuilt after the events of Ground Zeroes). The Afghanistan map is huge, full of cities and bases and faceless enemy soldiers to punch. The structure is smart: every time you get on your helicopter (which you can call via Snake’s nifty “iDroid” device), you can pick your next task, whether that’s a main story mission or a side-operation. After the first couple of story missions, you get to do the next three in any order you choose. Some of the early missions are very similar to the two core tasks in Ground Zeroes. In the first mission, which was showcased in that great E3 2013 trailer, Snake has to go rescue Kaz Miller, which means you have to scout, hunt for intel to figure out where Kaz is being kept, and then carry him over Snake’s shoulder while rushing to the helicopter to be extracted back to base. Soon after this, you get to go see your new Mother Base, which is really cool. You can recruit enemy soldiers and brainwash them into joining you; you can develop and build weapons and gadgets; and you can assign your staff to do various tasks at the base. I didn’t have nearly enough time to really dig into this, but from what I can tell, it’s like a deeper version of Peace Walker’s Mother Base system. To recruit new staff, you have to knock out enemies—or animals—and then attach a Fulton recovery device to parachute them to base. An anecdote: at one point, I accepted a mission to go assassinate a dude in a military base. Once I got into the field, I realized my weapon loadout wasn’t great, so I poked around in the Mother Base menu and assigned some staff to develop a sniper rifle, then had them deliver it to me via Fulton airlift. I cracked open the box, grabbed the rifle, and immediately took out my target. It was… liberating. At the beginning of the game, Snake has forgotten his foreign languages, so you’ll have to go recruit a translator if you want to be able to interrogate enemy soldiers properly. This is one of the first side-ops in the game. I assume there will be many. Kiefer Sutherland is not very chatty. Guess he was expensive. Like Peace Walker before this, you can play as other characters during some side-ops—at the start of each mission, you pick a loadout, which includes main character, gear, and whatever buddy you’d like to take along for that given mission. Buddies include a horse, a dog, and the sniper Quiet, who I didn’t get to meet during my time with the game. Presumably there will be other soldier buddies, too. Snake can lean to either side of the horse in order to dodge enemies while riding, which seems like a dangerous misuse of physics. There’s a cardboard box, of course. 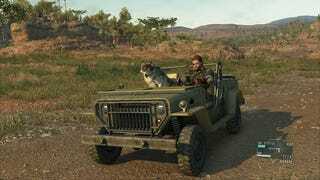 The Phantom Pain is out September 1 for PS3, PS4, Xbox 360, and Xbox One. It’ll also be out for PC on September 15. We’ll likely see more from Kojima’s final stint with Konami at E3 next week, and of course we’ll have way more to say about the game once it’s out and in our hands.